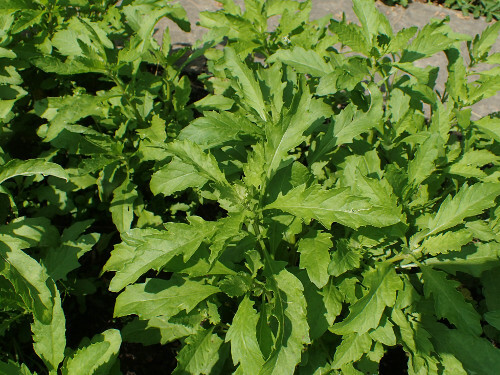 (Wormseed; Chenopodium ambrosioides) A rising culinary star! Essential in traditional Mexican and South American cooking, especially bean dishes and soups, and in contemporary Latino fusion fare. There is no real substitute for it. The fresh leaves are like "grassy turpentine" but when simmered in a pot of black beans, the flavour "mellows to a rich, grounding presence that more and more chefs are finding addictive," according to the trend-spotting Center for Culinary Development. Its use in food may related to ancient medicinal use. Since the time of the Aztecs it has been used to treat intestinal parasites and flatulence, and an early innovation may have been to add it to foods as a preventative measure. Native to south and central America, it has naturalized to the southern U.S. The seeds and the oil from the seeds are traditionally prescribed to expel intestinal parasites, and the oil is used in soaps, perfumes and detergents today. Some studies have shown epazote to be effective against athleteʾs foot. Seed requires light and may take several weeks to germinate. The plant prefers a rich, well-drained soil in a sunny position, but will tolerate poor soil. Pinch back to keep from going to seed. Younger leaves have a milder, richer flavour. Harvest leaves before the plant flowers and sets seed for best flavour. NOTE: The seeds and the seed oil are very potent medicinally and should be used only with great caution, and never by those who are pregnant or hoping to conceive. Some authors appear to have assumed that the leaves are similarly potent but centuries of use in food suggests that the leaves are quite safe when consumed in reasonable amounts.